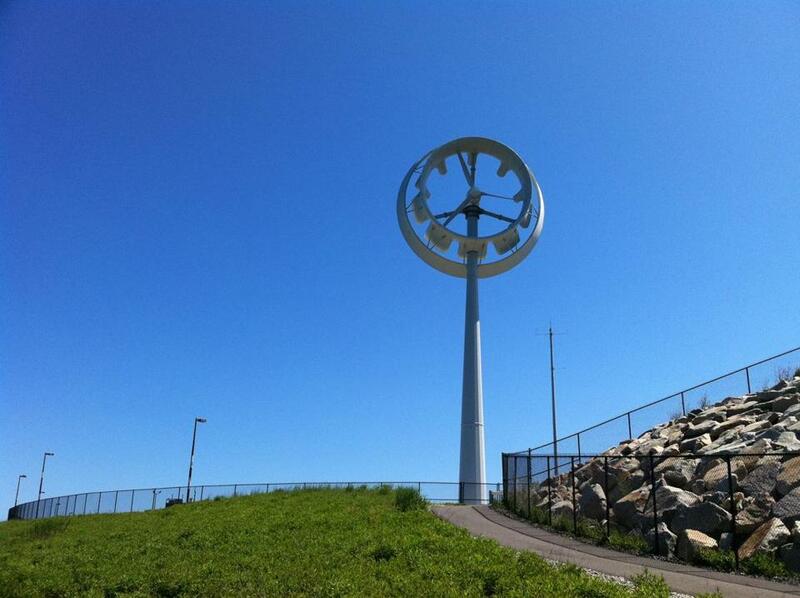 What went wrong with that weird wind turbine on Deer Island? If you’ve taken off from Logan Airport, you’ve probably seen the unusual white wind turbine on Deer Island — the one that looks a bit like a lollipop and stands apart from the two more traditional turbines that produce electricity for the water treatment plant there. The turbine was planted in 2011 by Ogin Inc. as a demonstration of the company’s new technology. (Ogin, at the time, was known as FloDesign Wind Turbine.) Ogin said its “ducted” turbine — the duct refers to the ring of fiberglass that helps channel wind toward the blades — would extract more power from even gentle breezes. It also would be quieter and kill fewer birds. And because it was more compact than traditional turbines, you could fit more of them onto the same amount of land, generating more electricity. Ogin raised more than $150 million in funding — even attracting the attention of former Vice President Al Gore, now a senior partner at Kleiner Perkins Caufield Byers, one of the company’s earliest backers. Late last month, the company entered receivership, and its assets are up for sale. Investors wrote their investment “down to nil,” as a press release from the New Zealand Super Fund, a government pension fund in New Zealand, put it. One issue with ducted wind turbines is that while the fiberglass ring can direct more wind through the blades, “it creates a tremendous amount of drag on the device whenever wind is present,” Gipe says. That drag means that the tower that holds everything up has to be engineered to be sturdier — and more expensive — than your garden-variety tower. As a result, ducted turbines tend to stand less tall than conventional wind turbines, so they miss out on the brisker winds higher up. When I spoke to Lars Andersen, Ogin’s then-chief executive, in 2011, he spun one of the benefits of shorter towers as having “lower visual impact” on the landscape. That is, fewer complaining neighbors. “Their claims varied, depending on who they were talking to,” he says, adding, “They were clearly very good at raising money.” But Manwell and others point out that when startups try to sell wind technology, they find themselves competing with established players like General Electric, Vestas Wind Systems, and Siemens Wind Power. All those companies have proven the reliability and performance of their turbines over years in the real world; no startup has that track record. But the plan didn’t work, and Ogin ran out of money. One of its biggest investors, the New Zealand Super Fund, lost about $38 million. Goldman Sachs, Canada’s Alberta Investment Management Corp., and the utility operator NRG also took a hit. Some of the Ogin technology has been acquired by Vestas, based in Denmark. As part of the Commonwealth’s 2010 investment in Ogin, the Massachusetts Clean Energy Center lent the company $700,000 on the condition that it create 150 jobs. If Ogin hit that goal and maintained the jobs until 2015, the loan would’ve been forgiven. But the company peaked at about 115 people, most of whom have since been laid off. The loan “remains outstanding,” Clean Energy Center spokesman Craig Gilvarg said. None of the current or former Ogin executives I contacted by phone and e-mail responded to requests for interviews, nor did founder Stanley Kowalski III, who is now chief executive of a startup in Wilbraham called FloDesign Sonics. And about that turbine on Deer Island? It has turned into a kind of tombstone for Ogin. It hasn’t been producing electricity since February 2015. Last year, the company told the Massachusetts Water Resources Authority, which runs the Deer Island water treatment facility, that “they planned to stop all plans to repair the unit and are not planning to upgrade it to the commercially-viable model as spelled out in their license agreement,” MWRA spokeswoman Ria Convery says. Over nearly four years, the Ogin turbine produced about $6,000 worth of power and green energy credits that the MWRA can resell, Convery says. That didn’t compare well with the larger turbines on the island, which each produce about $100,000 of power and credits per year. Rather than letting the Ogin turbine deteriorate, the MWRA would like it taken down. As Ogin’s assets are being sold off, it’s possible that the receiver might cover the cost — estimated at $350,000 to $400,000. But if something happens to render the turbine unsafe, like a big storm, it’s also possible that the MWRA might get stuck with the tab, an unfortunate situation for an agency that was willing to take a flier on a new technology.